Pico projectors are nifty little devices, but they haven't quite gained the popularity that their producers believed to they would. That's not to say that pico projectors are entirely useless. They do have a bit of a niche market and there are still a ton of people out there that like them and use them regularly, which is why companies keep making them. The newest pico projector to hit the market is the P4 WiFi Pico Projector by AAXA. The P4 by AAXA is a pico projector that comes with built-in WiFi connectivity and is capable of producing up to 100 lumens of brightness, which is a 20 lumens improvement over the previous model. In addition to that, the P4 utilizes the latest converter green technology from Osram in order to increase brightness while also remaining energy efficient. The battery life is said to last for up to 75 minutes, which means it is good for on the spot projection, though anything substantial will require you to leave the device plugged in. The integrated 750MHz processor allows the P4 to display 720p HD video with aplomb. This capability perfectly complements the 2GB of internal memory, which can also be further upgraded via microSD card slot. The P4 also comes with a keyboard/mouse combo that makes using the device quick and easy, no matter what the situation. 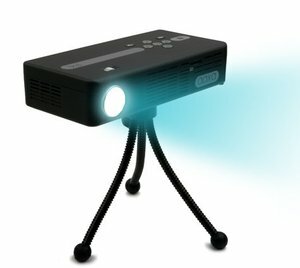 As far as pricing goes, the AAXA P4 WiFi Pico Projector retails for $399, which is a little expensive, especially considering the fact that you can get a standard, tabletop projector for that same price or less, though the main selling point here is obviously the portability and the HD video. Pico projectors aren't for everybody but they do have their uses. They're great if you want to pop one out and project something on the spot or for traveling if you decide that you want to watch a movie while on the road. Like I said, the P4 WiFi Pico Projector from AAXA retails for $399 and is available now.